Most people know the Poodle as the pampered pet. However, it is more than that. The Poodle is an incredible multipurpose dog that excels at canine sports. This pooch comes in three sizes: Toy Poodle, Miniature Poodle and Standard Poodle. All three variations are the same except for their sizes. They are all playful, friendly, smart, responsive and eager to please. Are you planning to buy a Poodle? Here is a brief background on this elegant dog breed. The Poodle is one of the oldest breeds believed to have originated in Germany. The name comes from the German term Pudel, which means "one who plays with water". It was bred as a water dog with the purpose of retrieving game from rivers and lakes. The breed had graced 15th- to 16th-century paintings and artefacts all over Europe. In the late 18th century, the Poodle became the principal pet dog in Spain as shown in the paintings of the Spanish artist Francisco Goya. At the same period, Poodles were the pampered favourites during the reign of King Louis XVI of France. Over the years, the Poodle has proved to be a useful dog. It was used as a guard dog, military dog, guide dog, circus performer, and wagon puller for entertainers. With its elegant and charming appearance, the Poodle genes have been utilised to develop other dog breeds such as the Miniature Schnauzer, Standard Schnauzer, and other Bichon type dogs. The Poodle has been bred in three sizes, which include Toy Poodle (6 to 9 pounds), Miniature Poodle (15 – 17 pounds), and Standard Poodle (45 to 70 pounds). The Poodle has an athletic body, square build, elegant appearance, and noble carriage. It has a round and narrow skull, long muzzle, oval-shaped eyes that are either brown or black, long flat ears that flop forwards near the cheeks, and a tail that is carried high. The coat is naturally curly, harsh and dense throughout. It comes in various solid colours including black, cream, white, silver, red, apricot, brown, and fawn. 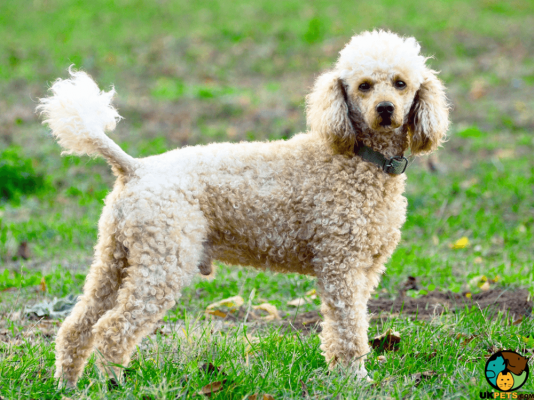 The Poodle does not shed much, which is suitable for dog owners with allergies. Dog grooming includes regular clipping, about every 6 to 8 weeks. It is a high-maintenance dog since it forms matts and tangles quite easily, which may require owners to hire a professional groomer. Other aspects of grooming include dental care such as brushing the teeth regularly and checking for signs of gum disease and bad breath. Keep on top of cleaning the ears to avoid wax build-up and infection. Also, trim the nails every week or two to prevent painful overgrowth that can cause cracking and splitting. Poodles are friendly, easy-going dog breeds that like to be with people and other dogs. They are funny creatures and are natural-born entertainers. They love nothing more than to be the centre of attention. Poodles are also among the smartest breeds, capable of outsmarting its owners. Often their intelligence translates into stubbornness if not trained or socialised early. The Poodle (regardless of size) is a good watchdog and will bark at anyone approaching the house. Although they come in different sizes, Poodles share the same temperament except for some minor differences in behaviour. For example, Standard Poodles are active and lively but also a bit aloof and like to have something to do. Miniature Poodles, on the other hand, are the most active among the three sizes and are a bit more mischievous. Whereas, Toy Poodles are the ideal companion dogs because they are confident and small enough to dwell in city apartments. The Poodle is a great companion for children, although Toy Poodles are more suitable for households with older children who know how to handle a small delicate dog. As with all breeds, children should be taught how to approach and treat dogs. Always supervise any interaction between the dog and the children, so no one gets hurt. When it comes to other pets, the Poodle gets along with all dogs and even small animals especially those that grow up with it. A typical serving for an adult Poodle will vary depending on its size:Standard Poodle – 1 1/2 to 3 cups, Miniature Poodle – 3/4 to 1 cup, and Toy Poodle – 1/4 to 1/2 cup of high-quality dry dog food. If you want to be sure that you are providing the exact amount and the right balanced diet, consult a veterinarian. Always provide your Poodle with the nutritional requirement it deserves. Make sure you buy commercial dog food formulated to its size. Also always check to make sure one of the top ingredients includes animal protein. The Poodle generally has a 14- to 15-year lifespan. It can reach its maximum age if it is provided everything it needs to be healthy and happy. 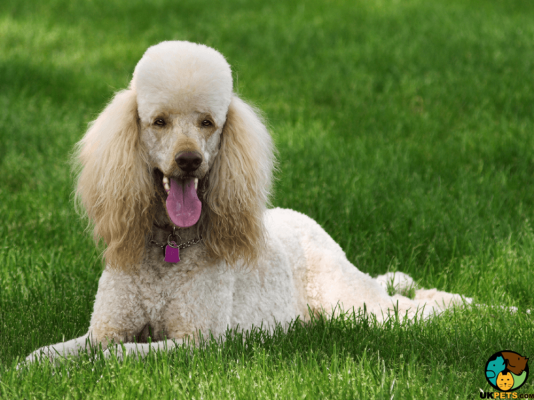 However, like most dogs, Poodles are also prone to certain genetic health issues such as Addison's Disease, Gastric Dilatation-Volvulus, Cushing's Disease, Epilepsy, Hip Dysplasia, Hypothyroidism, Legg-Perthes Disease, Patellar Luxation, Progressive Retinal Atrophy, Optic Nerve Hypoplasia, Sebaceous Adenitis and Von Willebrand's Disease. 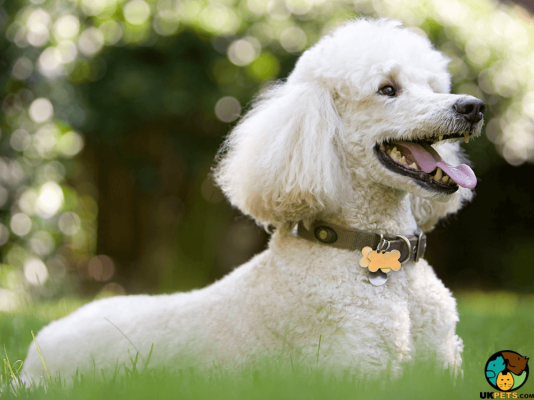 The Poodle is a highly energetic dog that requires 60 minutes of exercise daily. You can also provide it with a short and challenging play session or take it to a swim. They can also benefit from obedience session so that they can be mentally stimulated especially for a smart dog breed such as the Poodle. If you plan to buy a Poodle puppy, then you will need to pay anywhere from £450 to £1000 especially coming from a reputable dog breeder. Also set aside a budget for affordable pet insurance, which can cost around £20 to £40 a month. However, the pet insurance cost will depend on where you are located, the dog's age and the status of its health. The amount you will spend on food will also vary depending on the age and size of your Poodle, but a fair estimate is around £30 to £50 a month. Veterinary care is also a significant expense that will quickly set you around £800 a year. Vet care cost includes regular veterinary consultations, vaccinations, boosters and spaying/neutering. To cover the cost of raising a Poodle, prepare to shell out an average of £50 to £100 a month. Is a Poodle Right for You? The Poodle is an incredible multipurpose dog that excels at canine sports. It is bred in three sizes include Toy, Miniature, and Standard. Poodles are friendly, easy-going dogs that like to be with people and other dogs. They are also among the smartest dog breeds, capable of outsmarting its owners. Regardless of size, they are good watchdogs and will bark at anyone approaching the house.